For the New Year I decided I needed to start participating in #AAF. 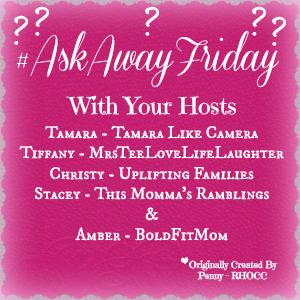 For my first Ask Away Friday post I partnered with April Grant from 100lb Countdown where she blogs about her life as a mother, wife and healthy living. 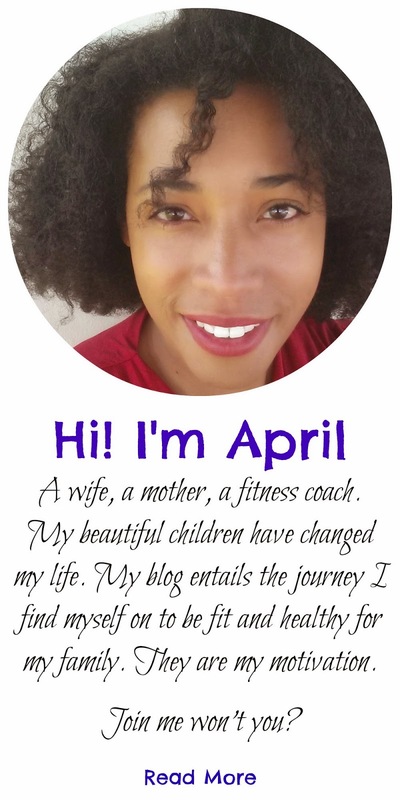 We both blog about health and fitness so I am looking forward to getting to know April better. To read her answers to my questions visit 100lbcountdown.com. Below are my questions from April. 1. I have three children, and I see you have five. What's the difference between having three and five children? I already feel overwhelmed and outnumbered by them. What are the pros and cons of having more? I barely remember what life was like when I only had three children. I remember having more time to myself then. But, I love having five and wouldn't change it for the world. With just three children you have the oldest child who is typically a leader and role model for the younger ones. Then you have the middle child or the peace maker. Then you have the youngest or the baby. When I just had three kids my oldest was 12 then the other two were 2 and 3. Because there is an eight year gap between my daughters it is almost like I have two separate families. Back when there were only three I felt like I had a tween and twin babies. They didn't really fit into the typical three sibling roles. When child number 4 came along I thought my family was complete. I had two of each and thought that if I had more I would be too overwhelmed. At that time my oldest was 12 and began to learn how to help me take care of the little ones. Parenting became a little easier for me with her help. When my fourth child was 10 months old I found out I was pregnant with number 5. 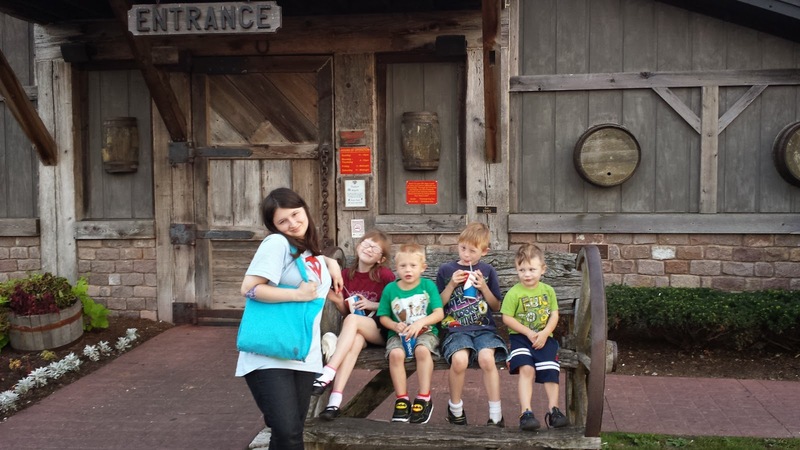 I didn't think that I was going to have five children, but I trusted in God and knew that is what He wanted. I also remembered what life was like growing up in a family with five kids and knew that I could handle it. Now that my youngest is four we are accustomed to helping each other out. They all understand that they have responsibilities and Mom can not do everything for them. All five are responsible for keeping their rooms clean. The boys have to pick up all their toys. My oldest who is seventeen now helps me take care of the younger ones when her father is out of town. She also helps with the dishes when she doesn't have school. We work together as a family team. My kids also know that if they do not take care of their chores for the day they will not get electronics. In this digital age every kid has a tablet or computer. That is their motivation to cooperate and help out. I love my large family and wouldn't change anything for the world. The pros of having a large family are that you have more helpers around. My kids love to help in the kitchen and with some household chores. They are also so different and unique. There is never a dull moment in the Talbert Zoo. They know how to spontaneously entertain Chris and I. I never know what to expect. I guess the only cons are that children are expensive. When you have a new baby your expenses go up. Then when they get older and they all want to participate in extra curricular activities you need to miraculously find extra money for that too. 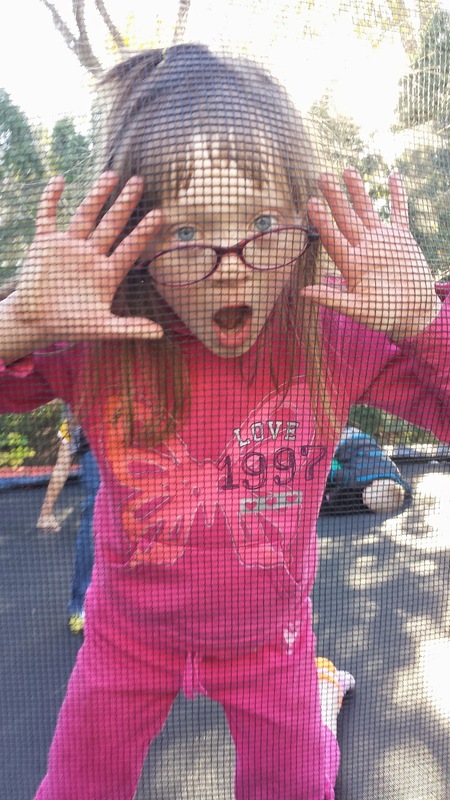 My kids are all at the ages where they want to do things outside of school. But when I think about what they want to do all I see are dollar signs and wonder when I will win the lottery so I can make them happy. 2. What's your typical day like? It's crazy. Can I end that there? Probably not. My weekend are very different than my weekdays so I will describe a typical week day. On Mondays and Fridays Chris works in his office which is about an hour drive in rush hour traffic from where we live. But he is out of town on Tuesdays-Thursdays every single week. 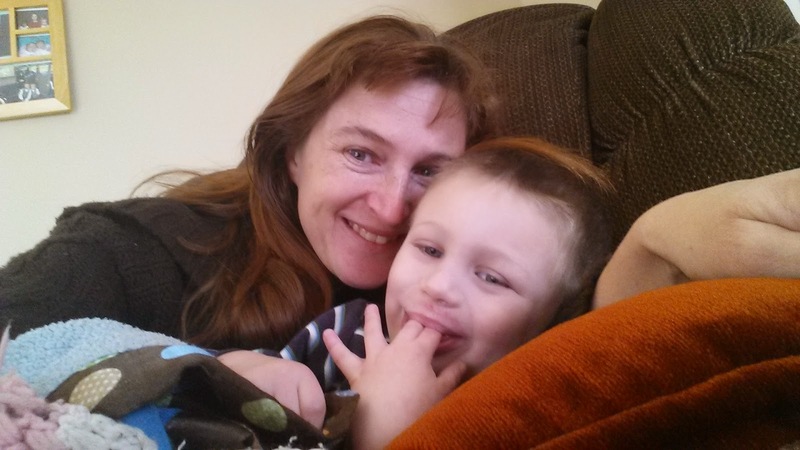 In the morning I am usually woken up before six by my two youngest sons, ages 4 and 5. They share a bedroom and whomever wakes first always wakes the other one. Then the noise begins. They don't know how to be quiet. I am hoping it is just a phase. I make my way downstairs by 6:30 and my kids know they can not bother Mom until after she has her coffee. At 7am I begin the mad rush to get my three elementary school aged kids ready for school. My oldest walks to school and she leaves shortly before 7. I make their lunches because we can not afford school lunch for all the kids. Then I help my little boy with ADHD get dressed for the day and line up all their back packs, jackets and lunches by the door. We head to school 8:20, school starts at 8:30. My favorite part of the day is when I get home from dropping the kids off and I just have my youngest with me. My mornings are spent either going on a walk with him when the weather is nice, or working out for 20 minutes. On the weekends I go for a run in the mornings (except this is now on hold because I recently fell down the stairs and bruised my tailbone). Then, I shower and get a bite to eat. Throughout the day I do housework, work on my three websites, talbertzoo.com, thehealthymoms.net and healthymoms-social.com and work on my book. Little Bear takes a nap at 1pm and that is when I usually read and comment on blogs. At 2:30 I leave to pick the kids up from school. School lets out at 3:30, but in order to avoid having to park in the street parents have to arrive at least an hour early. Bear and I sit in the van and I read or play puzzle games on my Fire tablet. Bear plays preschool games on Parrots Kindle HD while we wait for the kids to get out. When the kids get home I make them sit at the dining room table to do their homework before they can have their electronics. Kitty (age 8) practices her guitar for 20 minutes as well as doing her homework. We don't have a lot on Monday nights. I get dinner on the table by 5pm and Chris gets home at 6. Family dinner is very important to us. We sit and talk about our day and I ask the kids one by one how school was, what they learned and who they played with on the playground at recess. Chris leaves to travel before everyone wakes on Tuesday mornings. After school Monkey, Kitty and Parrot have religious education at our church at 4:30. I stay there to help Parrot (age 7) because he has autism and needs the extra attention. Religious education ends at 6pm. Tuesdays are leftover nights so dinner is a breeze. On Wednesday nights Kitty has youth choir at church and Goose (age 17) and I are in the adult choir. I play the flute and Goose sings. Youth choir is at 6 and adult choir is at 7. I make sure I have dinner on the table by 5pm. Goose helps clean up after dinner while I run Kitty to youth choir. On Thursdays Kitty has her Little Flowers Girls club meetings at church after school. Thursdays are also leftover nights. Chris gets home when everyone is in bed on Thursday nights. We don't have any extra curricular activities on Fridays. I usually serve fish for dinner on Friday nights, especially during Lent. We are catholic so we abstain from red meat on Fridays during Lent. We sit down for dinner at our usual time of 5pm and Chris gets home from work at 6. Usually my kids start getting ready for bed at 6:30. With four little ones, bed time is a long process. They get their pajamas on, brush their teeth, and read stories. At seven we let them watch special children's shows on our Fire TV. We are Amazon prime members so we are able to stream thousands of titles to our television. Bed time is 8pm. Once the kids are in bed I have a glass of wine and fire up the television and my computer. If there isn't anything good on TV then I watch Fox News. Sometimes I will stream music on my Fire TV instead of watching television. I also spend this time reading and commenting on blogs. I go to bed at 10pm. Sorry this was so long! 3. Tell us... what are the best traits that your children get from you... and your worst? Goose isn't like me at all. She is a lot like her biological father. The boys love to entertain and be the center of attention like myself. Monkey is a lot like Chris. Raising Kitty is just like I am raising myself at her age. She is so much like me in a way it is scary. But at the same time I love it. She is strong willed, independent, musically inclined, loves to entertain and be the center of attention and is a natural born leader. All of those traits are just like me. I think they are all good traits although, she has gotten in trouble for being too independent. 4. What made you decide to start an online magazine? At the beginning in 2007 it was just a little blogspot blog. My intentions was to just keep it a blog with helpful information on parenting and healthy living. Then it was just called "Healthy Moms." After a year of blogging I started getting offers from advertisers, mostly to review products and I got a little ad revenue as well. 2008 was a good year for my blog until I nearly got sued. I received a letter from an attorney which stated that "Healthy Moms," was trademarked and I had to change my blog's name because the lady who had that term trademarked stated that her clients were getting confused. By summer of 2008 if you did a google search for the term "Healthy Moms," my site was number one. Apparently she didn't like that. I had to get advice from an attorney myself in order to get out of the hot water I got myself into. So, I re branded my site and turned it into an online magazine. I am very proud of my humble beginnings with that site and how it has grown today. If you want to learn more about why I started the Healthy Moms Magazine you can visit my about page. 5. What type advice do you find most moms want on Healthy Moms Blog Magazine? Moms are looking for positive parenting solutions, how to have a healthier pregnancy, how to lose the baby weight (especially their mommy belly), and how to find more time to take care of themselves or "me time." The articles on those topics seem to be the most popular. 6. What do you find is the major difference for providing advice to moms versus other women? For one thing, if you don't have kids you do not know what it is like to be the care giver. The only person you take care of is yourself. Moms want to know how to take better care of their whole family, not just themselves. A plain old women's health magazine would not discuss what to do if you think your child has allergies or how to connect with your husband during pregnancy. As the matriarch of our families, us moms care about a wide variety of issues. Children change our lives. 7. What's your biggest health struggle? Believe it or not I have quite a few health struggles. I suffer from anxiety, depression and insomnia. I take medication for my insomnia. But, I would say the biggest health struggle for me is making time to take care of myself. 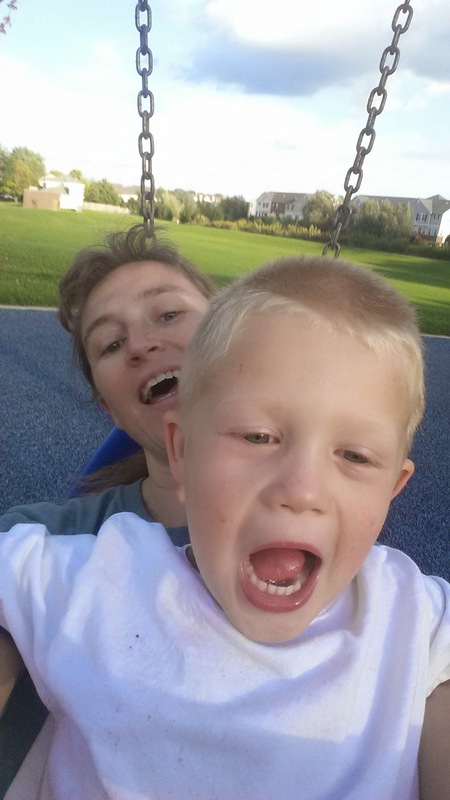 I blog about "me time for busy moms," on The Healthy Moms Magazine a lot, but that is still a struggle for me. Back in 2010, I learned the hard way that I wasn't setting aside enough time for myself. A couple of days after Thanksgiving I got really sick and ended up in the hospital. I had severe stomach pains and my liver enzymes were uncontrollably high. After several tests and nearly a week in the hospital doctors determined that I had a virus that was attacking my liver. Today, I take supplements to help keep my liver healthy. I also can't take acetaminophen (Tylenol) and I shouldn't drink but with five children I can't give up my wine. 8. What are your health goals for 2015? My health goals got put on hold when I fell down the stairs a couple of days ago. After my tailbone heals, which should be in about a month, then I am going to get up early every morning and go for a run before Goose leaves for school, as long as the temperatures are above 20 degrees. Chicago winters can be brutal. 9. Where would you like to go on a dream vacation? I would love to go to a warm beach, just about anywhere. Maybe the Bahamas or Jamaica. I heard that Jamaica is beautiful. I don't like winter or cold temperatures so I'd like to be anywhere warm, without the kids. 10. Describe your dream home... including location, size and layout! This may surprise you but my dream home would be right here in Crystal Lake, Illinois. We have moved three times since Chris and I got married and we've finally found a community where we feel at home and want to stay to raise our kids. The house would have to be within walking distance from my kids' school so I don't have to leave so darn early in order to get a parking spot to pick them up. Currently we rent and would love to be home owners again soon. I've been looking at houses on zillow in the neighborhood that we would like to move to. The ones that I absolutely love are two stories with finished basements and a decent size back yard. Because there are seven of us and I don't know if Goose is going to move out any time soon, we would need a five bedroom home. Chris loves to cook and we spend a lot of time in the kitchen. I would love for our next home to have a large kitchen with updated appliances, an island and plenty of storage space for food and all of Chris' kitchen gadgets. Right now most of our kitchen appliances and dishes are in the garage. I hope my post wasn't too lengthy for you! I understand if you didn't read all of my answers completely. If you are participating in #AAF this week please leave your link below so I can visit you!